Brit to build in, and live albeit temporarily, a plastic house built of LEGOs! As part of his BBC series 'Toy Stories', James May will build a two story Lego house and live in it for a couple of days! He needs bricks, ha, no surprise there. Why didn't Lego think of this? We'll try to report on construction with photos as it goes on. Can't wait to see it. My only question is... Is it a joke or for real? It sure looks scientific to me, really, go see the link. For those following the ongoing dialogue between plastics.com and anti-plastics activists I'm posting a great reply received by email which for some technical reason wouldn't post as a comment from him. He has some well thought out comments and after his reply I'll post mine as well. Since Beth Terry's audience and ours are very different, I'm cross posting some of the comments to be sure they;'re seen from both sides. Hello Greg, greetings from Seattle. I'm an artist and cultural activist who appreciates your posting here. I think of myself as an anti-plastics activist (among other things) and I have personally met hundreds of anti-plastics activists all over the world. But I have never met anyone who is rabidly anti-all-plastics as you characterize most activists to be. The few activists who are totally anti-plastics would have to live in denial of the fact that we all benefit enormously from living with plastics. A simple example: as I write this message, my fingers are typing on a well-designed and durable plastic keyboard; I'm looking at a computer monitor that is loaded with plastic components (including the screen I’m reading); I'm sitting in a comfy Aeron chair that's about 90% plastic. We Americans all live like this, and we all recognize the many benefits of plastic. The whole set of arguments that the plastic companies like to make about how great plastic is, miss our point entirely, because the vast majority of plastic activism has very little to do with plastic computer keyboards or Aeron chairs. The kinds of plastic we rage against are the same kinds that you disparage in your posting above: wasteful, disposable plastics that have no real value in our culture, and that are causing harm to the environment and people in numerous ways that we are still discovering. To be specific: plastic soda bottles, plastic water bottles, plastic bags, disposable plastic toys, plastic packaging of all kinds, plastic cups, plastic juice bottles, plastic eating utensils, plastic take-out containers, and all the other cheap plastic junk that didn’t exist just a few years ago and that could be eliminated without any significant sacrifice to humanity. That is the kind of plastic that the vast majority of activists are trying to put a stop to. I think it's great that you don't like that kind of plastic either-- and you even believe that using wasteful plastic packaging should be a crime. That's the kind of thing we activists like to say! One reason there is so much emotion involved in the activism community is that many activists have the perception that the few chemical company executives who are personally making billions from manufacturing and selling this kind of stuff do not hold the beliefs that you set out above. I wish you were speaking for the plastic industry in your posting, but you are not. Not by a long shot. As far as I can tell, the small community of billionaires who run the big chemical companies are lost in a fog of ego-driven personal greed. They care more about the game of power and big business than they care about the well-being of our world, and this drives them to make decisions that more awake people around the globe consider to be atrocious. For example, they invest millions in marketing campaigns designed to make problems like the Pacific Garbage Patch look innocuous, so they can continue profiting a little longer from the harmful junk they produce. These are the same types of people as the oil company executives who invested millions hiring quack scientists to make global warming look innocuous so that oil consumption would not decline. The only kind of person who would do this is someone who is driven by fear and greed. Someone who lack emotional depth and complexity, compassion for others, and any kind of spiritual connection with the earth. I know this because I was like that once myself, as a corporate attorney who represented insurance companies and big oil interests. With the help of a good therapist, I made it over from the dark side, but not everyone does. Plenty of people unknowingly stay stuck and lost in the machinations of fear and ego for their whole lives, and unfortunately many of them are politicians or executives at giant corporations. These people hold tremendous power over enormous resources, and collectively they are fostering the continued ruination of the world that we activists hold sacred. This is an incredibly frightening and destructive situation that brings out a deep rage in those of us who care about our world and can see what is happening to it. These guys hold onto shallow justifications for their actions, refusing to take responsibility (and the opportunity) for making our world a better place from an authentically altruistic position. One example is a common position they take: “we just produce what the public demands, and when the public demands environmentally responsible products, we will produce them.” It’s a lame argument that is transparently motivated by the desire to delay changing. Apple Computer didn't wait for the public to "demand" an iPhone; Toyota didn't wait for the public to "demand" the Prius; the Lego company didn’t wait for children to “demand” the best toy ever invented. Those companies put millions of dollars behind their most creative engineering resources to develop something new and exciting that the public couldn't even imagine. Similarly, the plastics companies should not wait until the public "demands" environmentally responsible plastics; the companies should be investing billions in inventing them because it is simply the right thing to do. And by the way, the public is already demanding environmentally responsible actions with respect to plastic. On the global stage, the United Nations chief environmental officer has called for the plastic bags globally. And on a more local level, here in Seattle our City Council recently passed a new law attempting to reduce the use of thin-film disposable plastic bags. The chemical companies’ response was to invest $200,000 in a campaign to get the law changed back, so they can keep selling and profiting from plastic bag production in our area. That’s what happens when the public demands something from the big companies that doesn’t involve increased profits: stonewalling, pushback, lawsuits, and sleazy marketing campaigns. If the guys who run the big chemical companies could honestly come around to the views that you set out in your posting, and put their millions into authentic and responsible engineering and marketing programs to help the public end its addiction to disposable and single-use plastics, then most of us plastic activists would celebrate with joy. The executives themselves would experience a revelation too: coming out of the bubble of fear that drives their lust for power and money is a good thing; it is liberating, exciting, connective, and good for the soul. It leads to happiness and fulfillment, two things that are sadly lacking in the hearts of too many powerful corporate leaders. These companies could lawfully and successfully turn their resources toward ethically responsible tasks such as eliminating single-use plastics worldwide, and the people who did it would reap the personal rewards far greater value than they ever imagined. But I don't see that happening anytime soon. Do you? First, please let me appreciate your art out loud, it is awesome and so thought provoking, great stuff! I appreciate all of your comments, read it all carefully. To your first point on the rabidly anti-plasts. They're out there, anyone who thinks we'd be better off with no plastics in the world falls into that category. They're the ones who worry me (as you noted, we agree on much) mainly because they're not informed. When I speak one on one with most and describe a world without plastics they almost all agree with me that it has become an essential material for many things. When a plastics professional comes across a true hater of all plastics, they'll tend to dismiss that person and their viewpoint. When they come across reasonable viewpoints about health and waste they are un-dismissible and tend to be taken seriously. I believe in our capitalist system, but it isn't without it's blemishes. Your comments about greedy execs really applies to virtually all publically held stock companies. Those execs have one concern over all others... stock prices. It's the nature of the system. Replace all the execs and all the new execs will find they have the same motivation. So even I (the libertarian leaner) see we need government to ride herd on these guys. Government is really the only entity that can provide alternative motivations to these guys. through taxes, credits and regulations that make/force the stock companies to comply. Large corps will only do what they are forced to do and whats good for themselves. Even when they do good, its for the goodwill they'll collect. I'm generalizing, there are exceptions, but I believe its mostly quite accurate. I think pretty much, appealing to public companies is idealistic and not likely to result in much change. The effective course, to me, is to grow your numbers and appeal to politicians. And I think addressing the public to engage about wasteful consumption will be more effective than convincing companies to not make plastic disposables. Anyway, just my opinion on tactics to help us achieve less waste, better health. Chris, thanks again for your art. Plastic: What is it good for? Absolutely Lots! 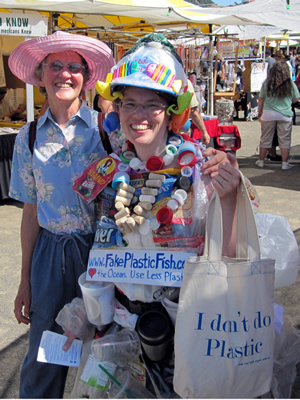 My anti-plastics environmentalist friend, Beth Terry in her plastics waste costume! OK, so I'm engaged with the 'anti-plastics' environmental movement. Typically, the people who HATE plastics. I observe this group because their strong feelings have the potential to do the industry harm AND because so many of their facts are not true or highly distorted. That said, I found one anti-plastics person whom I like. Beth Terry from fakeplasticfish.com. While committed to her cause, she isn't all wrapped up in the 'hate' emotion I see from many. We had a great discussion the other day which she blogged about briefly and she asked her readers seven questions related to the topics we discussed. So I thought I'd answer her questions from my perspective as an industry person. Keep in mind our site is not paid to promote plastics, but as an individual I've been very active and concerned regarding these issues. I worked in recycling for many years, patented and commercialized a recycle process, and was an original founder of the SPE Recycling Division (Now the Environmental Division). What do you see as the major problems with plastic? What uses for plastic (if any) are necessary and beneficial to society? Herein is one of the misconceptions many activists have. I don't like a no-plastics discussion because they usually seem based in severe ignorance of facts. I love a plastics versus other-material discussion because nothing should be made out of plastic without good reasons. The fact is that with today's population level and technology level, plastics are not just needed but are required to maintain civilization without going back to a pre-industrial era or without doing WORSE harm to the environment. So we don't (most of us) really want to get rid of plastics. We want them used responsibly and with care towards the environment and waste. Would you like to see a world without any plastic at all? What would that look like? This is my biggest point for simple 'anti-plasts'. What do you think is the alternative? If you want to go back to a pre-industrial era, so be it, but with today's population most of us will die from starvation and disease. If you simply want to make everything out of anything BUT plastics and live happily ever after, it simply isn't possible. The absolute fact is that if most things that are made of plastic were made of alternative materials, it would cause massive pollution, have huge global warming effects and would lessen the quality of life of virtually everyone. The reason things are made of plastics is almost always this: it's cheaper. We don't care about that, its just businesses getting rich, BUT, the reason plastics are cheaper than alternatives is because they use less overall energy than the alternatives. Now this HAS to interest us. When a product uses significantly less energy to manufacture, distribute and use then it also uses less oil, gas etc. to produce (less pollution), less oil, gas, etc. to distribute (less pollution), and less oil, gas, etc. to use (less pollution). An example; automobiles. Many plastic parts in an auto replace MULTIPLE metal parts with one part with the energy to make ALL of the previous parts being much more energy-wasteful than the one plastic part. I can't barely imagine a car without plastics other than a primitive, heavy monster. Now for the distribution, plastics cars weigh less than the alternatives and everything made has to be shipped. The shipping of ALL manufactured goods has a huge effect on pollution and it is weight and volume based. The less wight or volume, the less pollution created in the shipping stages. Lastly in usage, an auto that is much lighter due to plastics uses less fuel. Less fuel means less pollution. This example repeats itself over and over with virtually all use of plastics. Less pollution (energy) to make, ship and use than the alternatives. So can we do without plastics? Not without making things worse. I'd like to see intelligent debates of plastics versus alternatives, not just anti-plastics. What is better on a case by case basis then multiplied by the entire population doing it? A world without plastics would require unbelievably massive amounts of additional animals for leather, wool, etc and plants, for cotton and so on. And the effect ALL of the additional animals raised and grazing and forests cut down for crop land is staggering. I saw someone do the math once and it occurs to me that no environmentalist should be anti-plastics for just this reason. We either cut way back on population and go to a sustainable civilization based on lower technology or we find responsible ways to use plastics and solve environmental issues. Do you trust the plastics industry to tell you the truth about their products? Why or why not? Well, personally I don't trust governments or large corporations to tell the truth always. There's too many instances of the opposite to have blind faith. Also, most plastics organizations have an agenda to promote and protect themselves. It's good to have a healthy skepticism. Do you trust the American Chemistry Council to tell you the truth? What questions would you ask a plastics professional if you could? This happens everytime I talk to myself! What role do you think the plastics industry should play in solving the environmental problems associated with plastic? A leading role, and right now I see way too much defense of indefensible positions and simply promotional campaigns designed to make you appreciate plastics. Bah! The industry needs to admit the serious environmental and health issues, help study them and develop solutions. Companies do this when there is a profit motive but the industry as a whole seems to be all deny, deny, defend, defend. I don't see much of an effort to acknowledge and lead here. Plastics will be made in the future with algae, bacteria, plants, etc. Running out of oil is not a plastics future problem. Wasteful use of plastics, think packaging,ought to be a crime. There is nothing defensible about idiotic design using copious amounts of plastic that just gets tossed. There are applications where alternatives are preferred over plastics. Approach it on a case by case basis as to what is responsible, what is better than alternatives. Beth and I agree that wasteful design and wasteful consumption of plastics is a very bad thing. Plastics should not be used when an alternative that scales up to the population is environmentally better. Tameson, you can't fix the ocean gyre problem by simply fishing for plastic as most of it is tiny and you'd get plankton as well. May, a world without plastics is not as simply as 'look back at old photos' because the population has grown to a point where the alternatives are worse for us now.